Can Russia help build the peace in Syria? Russia has faced heavy criticism in the West over its military operation in Syria. The Russian air force has been accused of indiscriminate bombing. The human rights group Amnesty International says it has "compelling evidence" that Russian and Syrian government forces had "deliberately and systematically targeted hospitals and other medical facilities" in Aleppo in the north. But during our trip to Syria this week, the Russian military has tried to convince us that it is playing a constructive role: that of peacemaker. We were taken to two villages to see the Russian army handing out plastic bags with humanitarian aid: tinned fish and meat, dried peas and biscuits. Printed on the packages were the Russian and Syrian flags and the words 'Russia is with you!" (though written in Russian, not Arabic). In Maarzaf, near Hama, we saw a village elder signing a declaration of peace with a Russian army officer. The village pledged to support the process of reconciliation in Syria and bow to Syrian government control in return for security guarantees. A large tent had been erected for the occasion and many of the villagers were there to witness the event. Afterwards, the Russian army handed out Russian sweets and biscuits to local children. It was in Maarzaf that we met Ahmed Mubarak: a pro-Moscow local sheikh who is working with the Russians to persuade villages across Hama province to sign similar pledges. The sheikh has his own private army: many of his heavily armed "soldiers" were in the village for the ceremony; some had taken up positions on rooftops, others - with guns slung over their shoulders - wandered through the crowd. The Russian army had brought us to the village in an armoured vehicle and we had been advised to wear body armour here. Despite the peace agreement in this village, it did not feel as if peace was breaking out in Syria. The Russians admit that towns and villages are not rushing to sign peace deals. "Negotiations with villages are difficult," Lt-Col German Rudenko told us. He heads the Russian army's Reconciliation Group for Hama province. "People are worried that by agreeing to co-operate with us, they will face pressure from terrorist groups." The Russians have signed a similar peace declaration with the district of al-Tall, north of Damascus. 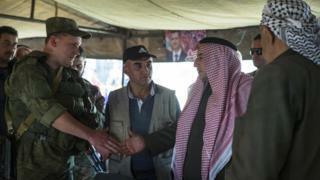 But that does not mean all armed opponents of President Bashar-al Assad have laid down their weapons. One resident in the town told me there were still "rebels" there, though she would not specify from which militant groups. "They are now thinking, they are not going against our army," she said. "Some of them are trying to settle down, some of them waiting. It's not very clear, but things are going in the right direction." The United Nations says that the cessation of hostilities in Syria, negotiated by Russia and the United States, is holding. But only just. The UN describes it as "fragile" and warns "success is not guaranteed". Syria: What can Russia's military do? On Tuesday, while we were visiting the village of Kinsibba, we heard explosions on the hillside. We and the other journalists we were with dived to the ground, then took cover behind a wall. The Russian general accompanying us radioed for back-up. An armoured personnel carrier reversed down the main street. The general ordered us to crouch behind it and use it for protection as it moved in the direction of our waiting cars. But not all of us fitted behind the APC. We heard more explosions. "Run, run!" shouted the general and we dashed the final 100 metres to the vehicles and to safety. The Russian defence ministry claims that we had come under artillery fire, and that eight artillery shells had been fired from the direction of the Syrian-Turkish border. Later Russia's Tass news agency reported that four foreign journalists had been "wounded in shelling in Syria". I cannot confirm what these explosions were or where they came from. A number of journalists in our group did receive light injuries, but not from artillery shells or shrapnel: these were cuts and bruises sustained during our hasty and rather chaotic retreat behind the armoured personnel carrier. Whatever had happened in Kinsibba, it certainly fitted in with Moscow's current narrative: that while Russia is pursuing peace in Syria, there are other forces who want the fight to continue. Video What is Russia's role in Syria?